Want Midna Back - View topic - Greetings, all! OBJECTION! As a former spammer I don't ever recall being banned. OBJECTION! Yes, but you're not a robot, which makes all the difference. Your Honor, objection sustained. I'm not that much into role-playing myself, and I don't think most of the other members are either. I only made a submission because I could. The RP forums used to be closed because no one used them. Sorry guys, I had to disappear for a minute! I'm back now. Well, that's a damn shame about the RP forums. However, I've been known to keep a game going for hundreds of pages with 2-3 people, so if I do come up with a solid idea, I may just post one up, anyway. I'll hope for interest rather than expect it. @LWM: Great! I'll get to work on organizing my thoughts. You guys should see the thread go up relatively soon if I don't get really distracted again. It does make all the difference. As a spammer, I can say with indisputable certainty that spammers and spam bots are different entities. Not a single spammer has ever been banned. I'm an acceptable spammer! I feel like I've achieved a great goal in life, a high hurdle has just been jumped, a mountain climbed. I am now one step better to becoming what I and all people strive to be. Nope. You know as well as I do that all people strive to be brooms, it's what we live for, what we yearn for, what we need beyond needing. I will be that broom. Twist, that made my day! What's next on your list to broomdom? I will become strong, carbon fibre reinforced handle, yet tender in my workings, foam-core grips for maximum comfort. I will rise above all others, 1.5m standard with extendible handles, and I shall rule with an iron fist, and steel alloy bristles. The ultimate life form. The ultimate broom. Twist: The sweeper. 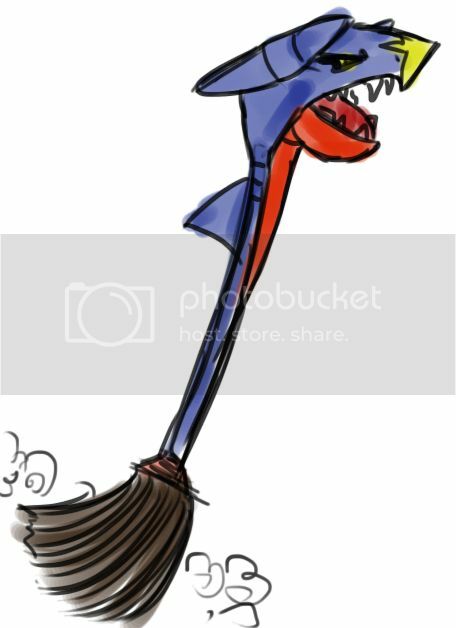 ...Why do you have to make me think of a broom with Garchomp's head? ...not quite sure how this conversation went from salutations to striving to be a broom.